Alumni meet is always an emotional subject for students, be it current students or passed out ones. The passed out students are eager to go back and feel the life where it all started and on the other hand, current students have a chance to meet the seniors and learn from them. We, at DoMS, had such an experience on 20th Sep 2013. The occasion was Reminiscence where three batches (first year, second year and recently passed out) of the department came together. It was one of the most awaited events for the students. The passed out students came to collect their degrees and were looking for reunion whereas second year students were having an opportunity to meet their seniors again and revisit the good times. Even first year students were enthusiastic about meeting their seniors. The event was organized by Alumni committee of DoMS, IIT Roorkee. It started with a welcome speech and then our Head of the Department Dr. Santosh Rangnekar addressed the students. 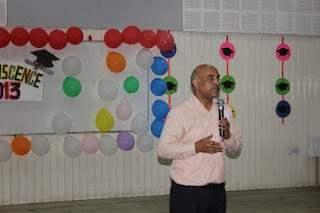 The event was also graced by Dr. M. K. Barua who appreciated the efforts of the students. After the addresses it was time for some thrilling performances. A series of high voltage and enthralling performances were given by the first year batch. Meanwhile the alumni were entertained by various fun games. After the performances, it was the time for alumni to come forward and share their experiences. It was a pleasure to listen to their stories. Meanwhile dinner was also served. Finally a note of thanks was delivered and it marked the conclusion of the event. Now it was time to rock the stage. The past and present students danced to their heart. They lived once again what they called as “Life”.